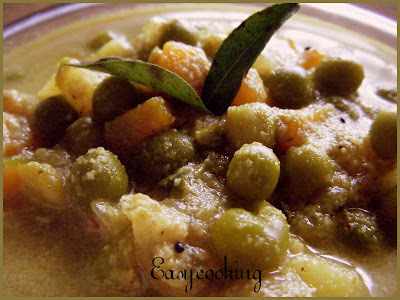 Easycooking: Green Peas Masala ~ Thattukada Style!! Most of my Google searches these days are for side-dishes.Yes,the one thing which I am always at a loss for.Since we have dry chapathis/phulkas for lunch and many a times for dinner too,I have to introduce some varities on the sides.After all,for how long can one eat dal and dal fry and dal tadka..you get the drift,don’t you?? We are not very fond of those Korma’s or Shahi dishes to have on a daily basis.It doesn’t serve the purpose of having rotis instead of rice.On the contrary,we’ll be consuming more calories in the form of all the butter,ghee and cream which goes into these curries.So I turned to my treasure house of recipes-yup,my own recipe collection from Vanitha magazine which I have bound into two books.I saw a very simple recipe for Green peas masala which sounded perfect.I had some frozen peas inside the freezer and I tried it rightaway. After tasting we felt the only thing missing was the ambience of a Thattukada[Road-side eateries which are quite popular in Kerala] and some Porotta’s to soak up the gravy.Perfect thattukada peas masala!! Pressure cook the green peas with potato,carrot,onions,green chillies with haldi and salt to taste for 2-3 whistles or till the vegetables become soft. Grind the coconut with few tbsp water to a smooth paste. In a kadai,add the oil and splutter mustard seeds. Add small onions and curry leaves and sauté till the onions become golden brown. Add the cooked peas and vegetables. Mix in the coconut paste and garam masala and let the curry come to a rolling boil. Tastes well with Chapathi and Idiyappam. 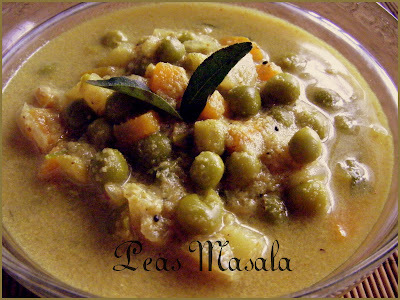 Check out my other versions of Green Peas Masala here and here. I love anything Thattukada :)!.. glad that you liked dates pickle!..but you'dnt answered me yet abt the choc powder you use/suggest? This looks so refreshing and so few ingredients required..cool. Me too like trying new curries to go with chapathis..will save this one.Looks delicious. Few ingredients and very easy to make. Good choice for a side for roti. The masala is quiet simple and looks tasty! i am making this tonight..looks yumm.. This looks just like what we get back in Kerala. The perfect thing with porotta! is this we can eat with rice?